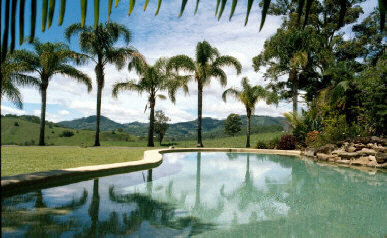 Welcome to our ninth edition of OZ-Escapes! Why stay in Bed and Breakfasts? At this time of the year when we are thinking this long hot summer will never end, it is refreshing to turn our thoughts to September and the event that is now synonymous with Spring on the Tweed, the Tyalgum Festival of Classical Music. Those of us who attended last year's Festival thought it was the best ever. With the benefit of ten years' experience and continual improvements, the three day feast of exceptional music and performance was carried out smoothly and efficiently. The village of Tyalgum hummed with activity and a reassuring sense of community. This highly successful musical event did not go unnoticed and at the Australia Day awards in January the Tweed Shire Council's Australia Day Committee named it the Community Event of the Year. This was a fitting occasion to give just recognition to the vision and commitment of so many people over the years. The Tyalgum Festival can feel that it has come of age and established its own special reputation in the music world. For those of you who have not been to Tyalgum, it is a unique village nestled among the valleys of the volcanic caldera that makes up the Tweed. As one visitor has commented, "to sit and gaze at great granite mountains, it is easy to understand that this was a special spiritual place for the aboriginal people, a place to think and contemplate". A great place to listen to classical music too. The bed and breakfast industry began to blossom during the 1980s, and B&Bs thrive today in large part because they provide an atmosphere of warmth and coziness that traditional hotels simply can't match. Most B&Bs are owned by the innkeepers, who often live on the premises. It's natural to expect that innkeepers who live in their own inns will bring a different perspective to the job than someone who works a shift behind a hotel reception desk and then goes home to forget about the customers left behind. At B&Bs, "customers" truly are guests, and it shows. Innkeepers will gladly help you find the best restaurant in town, point you to the most romantic spot in the nearby park, and much more. Most B&Bs generate a substantial portion of their income from repeat business. Many also depend on word-of-mouth recommendations. Combine those two factors and it's easy to see why most innkeepers go out of their way to make sure your stay provides some great memories. At OZbedandbreakfast.com, we are here to help you find the perfect Bed and Breakfast for your getaway. Simply click on a State and find the region you are heading to. A comprehensive list will appear for you to start your search. For your convenience, you can use our advanced search to search on keywords such as 'beach', 'mountain', 'romance' or 'farmstay'. 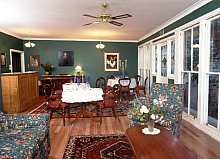 Altogether, OZbedandbreakfast provides you with over 900 Bed and Breakfast alternatives. So, click away for your perfect getaway! The best way to find what you're looking for may be the simplest: Just use the search tool found near the top of the homepage. Enter a keyword (such as the name of a city or activity), click "go" and you're on your way!